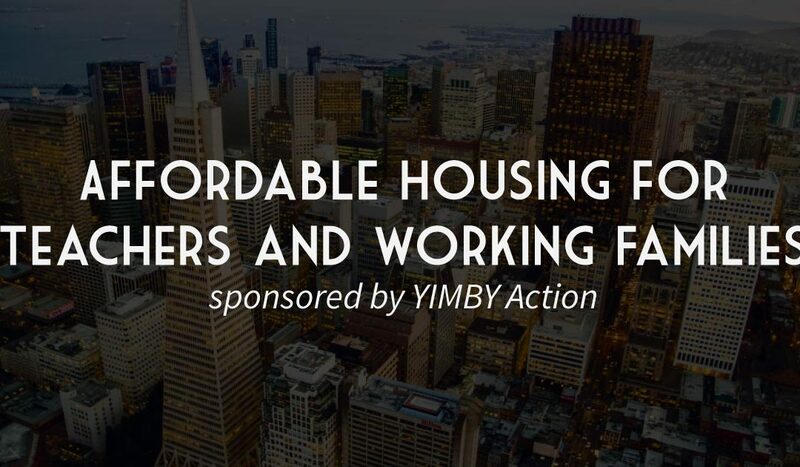 San Francisco — YIMBY Action and the San Francisco Housing Action Coalition are proud to announce a ballot measure to expedite the construction of 100% affordable housing projects, and housing for teachers and school staff, by granting by-right approval to such projects. The measure will help San Francisco build the affordable housing needed for its lowest-income residents and much-needed teacher housing. We submitted the measure to the Department of Elections on November 21 in hopes that it will be placed on next year’s ballot. San Francisco is facing a severe housing shortage driving its worst affordability crisis in recent memory. The urgent need for subsidized affordable and teacher housing is clear. The ballot measure would streamline construction of affordable and teacher housing by ensuring projects receive by-right approval. Under our ballot measure, affordable and teacher housing projects would get permitted without being subject to arbitrary discretionary hearings. Only projects that comply with the underlying zoning and planning code would be expedited. This measure will implement much of the by-right approval included in Senate Bill 35, the recently-passed state bill from State Senator Scott Wiener that expedites housing across California. It will bring San Francisco into compliance with state law and ensure the city actually builds the affordable housing we so desperately need. Because this ballot measure expedites subsidized affordable housing, only projects reserved for those making up to 80% of area median income in rental units and 120% of area median income in ownership units would be expedited under this ballot measure, as well as housing for teachers and school staff. Discretionary review in particular is a costly process whereby frivolous objections can slow down affordable housing for months or years, as happened to the Booker T. Washington Community Center affordable housing project, which saw costs rise some $10 million after a five-year slowdown from various process delays. More recently, the senior housing project at 1296 Shotwell St. was delayed after neighbors appealed the nine-story building due to height, shadow, and traffic concerns. This measure will save taxpayer money for the city government and non-profit affordable housing developers, allowing them to build more units of affordable housing with existing funds. Our ballot measure would also, for the first time, mandate San Francisco prioritize the speedy construction of subsidized affordable housing to mitigate our housing shortage and affordability crisis. San Francisco residents know the production of affordable housing is of utmost importance. This ballot measure is the first step to lowering the cost and increasing the amount of such housing, and we’re confident San Franciscans will vote it into law next year. Read the text of our measure here. Download a PDF version of this letter here.